The Matrix Revolutions is a 2003 American–Australian science fiction action film written and directed by The Wachowski Brothers. It was the third installment of the Matrix trilogy, released six months following The Matrix Reloaded. The film was released simultaneously in 60 countries on November 5, 2003. While it is the final film in the series, the Matrix storyline is continued in The Matrix Online. It was the second live-action film to be released in both regular and IMAX theaters at the same time. Neo and Bane lie unconscious in the medical bay of the ship Hammer. Meanwhile, Neo finds his digital self trapped in a virtual subway station—named, "Mobil Ave.", "mobil", being an anagram for "limbo"—a transition zone between the Matrix and the Machine City. In that subway station, he meets a "family" of programs, including a girl named Sati, whose father tells Neo the subway is controlled by the Trainman, an exiled program loyal to the Merovingian. When Neo tries to board a train with the family, the Trainman refuses and overpowers him. In the real world, the crew of the Nebuchadnezzar and the Hammer find and reactivate Niobe's ship, the Logos. They interrogate Bane, who says that he has no recollection of the earlier massacre. As the captains plan their defense of Zion, Neo requests a ship to travel to the Machine City. Motivated by her encounter with the Oracle, Niobe offers him the Logos. Neo departs, accompanied by Trinity. Bane, who has stowed away on the Logos, takes Trinity hostage. Neo realizes that Bane has been assimilated by Smith. Bane cauterizes Neo's eyes with a power cable, blinding him; however, Neo discovers an ability to perceive the world as golden light. Neo kills Bane, and Trinity pilots them to the Machine City. The Machines provide a connection for Neo to enter the Matrix. Inside, Neo finds that Smith has assimilated all its inhabitants. The Smith with the Oracle's powers steps forth, saying that he has foreseen his victory against Neo. After a protracted battle, Neo—finding himself unable to defeat Smith—allows himself to be assimilated. The machine leader sends a surge of energy into Neo's body in the real world. Because Neo is connected to the Source, the energy surge causes the Neo-Smith clone and all other Smith clones in the Matrix to be destroyed, though Neo dies in the process. The Sentinels withdraw from Zion, Morpheus and Niobe embrace, and Neo's body is carried away by the machines. The Matrix reboots, and the Architect encounters the Oracle in a park. They agree that the peace will last "as long as it can", and that all humans will be offered the opportunity to leave the Matrix. The Oracle tells Sati that she thinks they will see Neo again. Seraph asks the Oracle if she knew this would happen; she replies that she did not know, but she believed. In contrast to its predecessors, very few "source" tracks are used in the film. Aside from Don Davis' score, again collaborating with Juno Reactor, only one external track (by Pale 3) is used. Although Davis rarely focuses on strong melodies, familiar leitmotifs from earlier in the series reappear. For example, Neo and Trinity's love theme—which briefly surfaces in the two preceding films—is finally fully expanded into "Trinity Definitely"; the theme from the Zion docks in Reloaded returns as "Men in Metal", and the energetic drumming from the Reloaded tea house fight between Neo and Seraph opens "Tetsujin", as Seraph, Trinity and Morpheus fight off Club Hel's three doormen. The climactic battle theme, named "Neodämmerung" (in reference to Wagner's Götterdämmerung), features a choir singing extracts (shlokas) from the Upanishads. The chorus can be roughly translated from Sanskrit as follows: "lead us from untruth to truth, lead us from darkness to light, lead us from death to immortality, peace peace peace". The extracts were brought to Davis by the Wachowski Brothers when he informed them that it would be wasteful for such a large choir to be singing simple "ooh"s and "aah"s (according to the DVD commentary, Davis felt that the dramatic impact of the piece would be lost if the choir was to sing 'This is the one, see what he can do' in plain English). 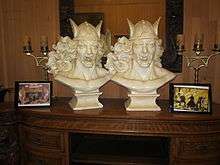 These extracts return in the film's denouement, and in Navras, the track that plays over the closing credits (which may be considered a loose remix of "Neodämmerung"). The film's budget is an estimated US$110 million. It grossed over $139 million in North America and approximately $427 million worldwide, roughly half of The Matrix Reloaded box-office total. In its first five days of release, it grossed $83.8 million, but dropped 66% during the second week. The film received a score of 36% on Rotten Tomatoes. The film's average critic score on Metacritic is 47/100. Conversely, Roger Ebert of the Chicago Sun-Times gave the film three stars out of four, despite offering criticisms of his own, on the grounds that it at least provided closure to the story well enough so that fans following the series would prefer seeing it as to not. ↑ "Film Distribution". Village Roadshow Limited. Retrieved February 11, 2014. ↑ "The Matrix Revolutions". British Board of Film Classification. Retrieved September 15, 2013. 1 2 "The Matrix Revolutions (2003)". British Film Institute. Retrieved July 22, 2015. 1 2 Allmovie. 2010b. The Matrix Revolutions. [Online] Rovi Corporation (Updated 2010) Available at: http://www.allmovie.com/movie/the-matrix-revolutions-v282917 Accessed 19 February 2010. Archived at http://www.webcitation.org/5nfGxGihq?url=http%3A%2F%2Fwww.allmovie.com%2Fwork%2Fthe-matrix-revolutions-282917. 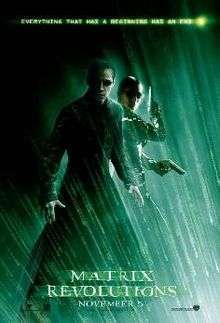 1 2 "The Matrix Revolutions (2003)". Box Office Mojo. Retrieved February 13, 2015. ↑ McKinley, Jesse (October 5, 2001). "Gloria Foster, Stage Actress, Is Dead at 64". The New York Times. Retrieved January 26, 2015. ↑ Hoberman, J. (November 4, 2003). "Holy Trinity". The Village Voice. Retrieved January 26, 2015. ↑ Sams, Christine (May 11, 2003). "Sydney sci-fi fans rush to re-enter the Matrix". The Sun-Herald. Retrieved January 26, 2015. ↑ Buchanan, Levi (February 12, 2003). "'Enter the Matrix' aims to open a new game era". Chicago Tribune. Retrieved January 26, 2015. ↑ "The Matrix Revolutions Movie Reviews, Pictures – Rotten Tomatoes". Rottentomatoes.com. Retrieved 2012-07-11. ↑ "Matrix Revolutions, The (2003): Reviews". Metacritic.com. 2003-11-05. Retrieved 2012-07-11. ↑ "Time to pull the plug on The Matrix. – By David Edelstein – Slate Magazine". Web.archive.org. 2010-07-27. Archived from the original on July 11, 2010. Retrieved 2012-07-11. ↑ Clark, Mike (2003-11-04). "– 'The Matrix Revolutions': This big finish isn't The One". Usatoday.com. Retrieved 2012-07-11. ↑ Scott Foundas (2003-11-06). "LA Weekly – Film+TV – The More the Murkier – Scott Foundas – The Essential Online Resource for Los Angeles". Laweekly.com. Retrieved 2012-07-11. ↑ "Baltimore Sun: 'The Matrix Revolutions' makes it a little easier to believe". Web.archive.org. 2004-05-06. Archived from the original on May 6, 2004. Retrieved 2012-07-11. ↑ Roger Ebert (November 5, 2003). "The Matrix Revolutions Review". Chicago Sun-Times. Retrieved November 10, 2014.